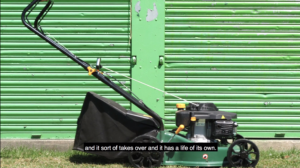 Dog Kennel Hill Project researched ideas for their new work The Wild Grass by cutting the lawns of residents gardens from Sneinton and St.Ann’s, Nottingham. The short film below was created with voices of those from the local area talking about why they love spending time in their gardens and local parks. Click the image below to view the video. The work will be performed at Dance4 in the Park and be a spectacle of choreographed formation lawn mowing. Donate to support the project by clicking here.